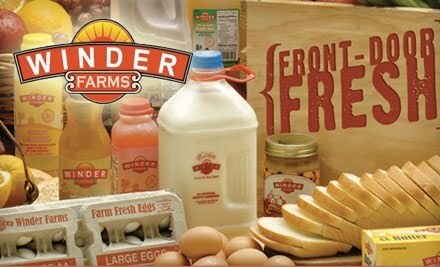 $50 Worth of Winder Farm Groceries for $20!!!!!! $50 worth of Winder Farm Groceries for $20! -There is no delivery or sign-up fee! You need to use the entire groupon in one order (easy). They have a lot of variety. -You can only buy one, but you can get 2 additional as gifts. What an awesome gift for someone!! Doesn't expire till 2/25/11 so you could use them as Christmas gifts!! -If your an existing Winder customer you can get this deal! If your a new customer they will provide the cooler at no charge. -Also this is a one time deal, you don't have to order from them again if you don't want to. -After you buy, you'll get an email (within 24 hrs) letting you know when you can print your Groupon. Instructions on how to redeem will be there. I love Winder! They have amazing milk and great products from other local businesses! I bought mine :);) AND their desserts! I actually have to be careful with Winder...the option of having donuts delivered to my door in the morning is far too tempting. They really are convenient. I used them when I had my kids. Who wants to go to the store with a newborn?? I'm sorry your injured. I'm glad this will help!! Get better soon!